Keep your pup's paws clean, healthy and dry with the Nooby's Multi Use Disposable Dog Booties! Can be used individually or with Nooby’s Protective Sleeve. 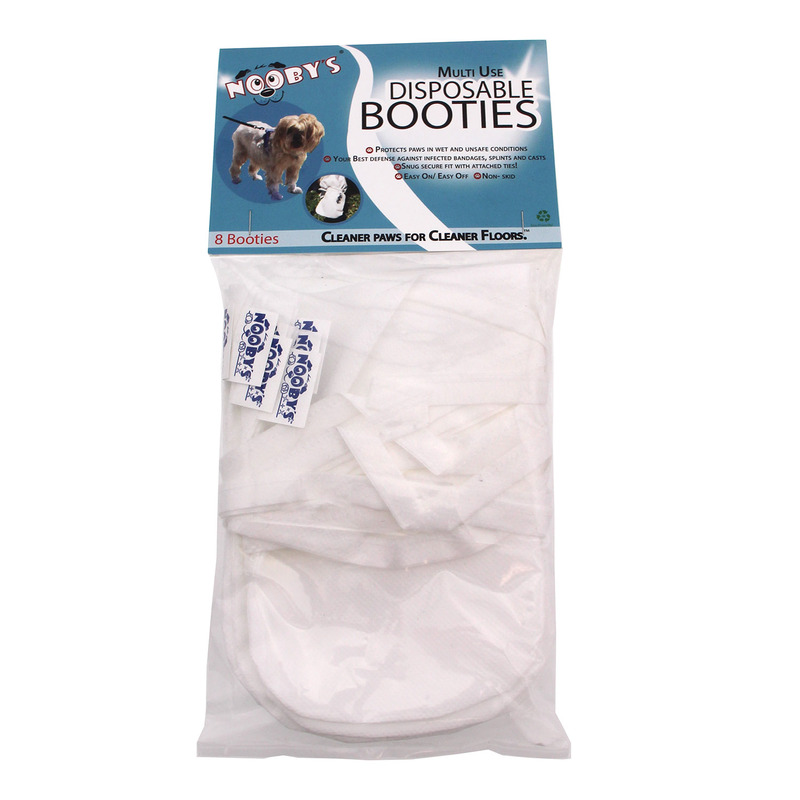 Our Nooby's disposable protective booties have been well-received by veterinarians across the country. They provide an easy-to-use, cost-effective solution for protecting wounds and guarding against post-operative hazards. 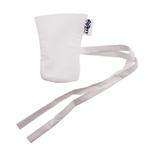 Nooby's booties protect bandages, splints, and casts from the elements and provide the best defense against infection. There's no need to hassle with more cumbersome and expensive alternatives. 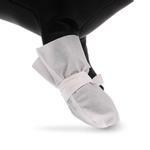 Our Multi-Use Disposable Booties protect paws in wet and unsafe conditions. Not only do they protect your pet's paws, they also help keep your pet's paws cleaner for cleaner floors. Nooby’s Booties are manufactured from a specifically formulated PP/PE (polypropylene/polyethylene) microporous film that provides strength and durability to the dog booties. They are manufactured to ensure that each product meets exacting quality standards and performs to specification. Nooby’s products are made from a strong, durable, anti-skid and waterproof material. Our Booties are designed to facilitate the healing process by offering protection to your dog’s healing paw from dirt, dust, rain, slush, chemicals, urine and other outside elements that could cause infection or irritation. Our disposable dog booties are designed to be used for short periods of time (up to an hour) while your pet is outdoors. The reason for limiting the time period is to ensure that moisture doesn’t build up inside, resulting in a damp bandage or compromising a splint. If the booties are being used for simple cleanliness reasons, they can be worn for longer periods. To apply, simply open the bootie by using your thumb and forefinger. Beginning with a front paw, place your pet's paw into the opened bootie. As the paw is fully inserted into the bootie, simply use the attached tie to fasten securely. Continue this process with the other front paw and then move to the back paws. Put disposable booties on your pet right before you go outside. It may take a few times for your pet to get used to the booties, but soon the process will become routine. Common sense caution: Nooby's Disposable Booties should only be used when your pet is supervised. Prolonged use could interfere with your dog's natural cooling system. If the bootie tears, replace it to prevent your dog from biting or swallowing. Please also keep your dog's nails trimmed. Posted On 09/10/16 by Pegeen H from North Arlington, NJ Yes, Pegeen H recommends this product! These disposal booties fit and stay on really well. Posted On 09/03/16 by Robin W from Saint Charles , MO Yes, Robin W recommends this product! Good shoes for the rainy muddy days.